He is a general surgeon with special interest in colorectal and pelvic floor surgery. His postgraduate training has been in the north west region and Yorkshire. After completing basic surgical training in Manchester, he went on to undertake a period of research in cancer biology that led to award of MD degree from University of Hull. Subsequently, he successfully completed specialist training in general and colorectal surgery in the Yorkshire region. Towards the end of training, he went on a clinical fellowship in laparoscopic colorectal surgery at University of Rochester Medical Centre in NewYork, USA for a year. Mr Veerabhadram Garimella does not hold a share or financial interest in this hospital, another Nuffield Health hospital or the company. 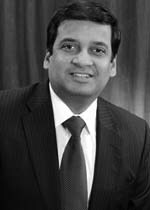 Mr Veerabhadram Garimella does not have a share or financial interest in equipment used at this hospital or another Nuffield Health hospital. Mr Veerabhadram Garimella does not hold any paid advisory role(s) at this hospital or on behalf of Nuffield Health.